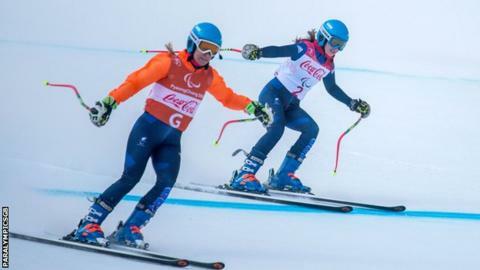 Menna Fitzpatrick and guide Jen Kehoe will take time out from para-skiing after an "emotional" and "exhausting" season. The pair took the overall World Cup title, as well as winning golds in the the downhill and Super-G at January's World Championships. Fitzpatrick said they remain focused on defending their Paralympic title in 2020. "It's been a very emotional season," she said. "We've been doing this for quite a long time. It's been very intense. "We are both super tired and exhausted from the long season but being back home I've started to recharge the batteries." Kehoe will now return to her studies at Army school for six months while Fitzpatrick focuses on her media production career. They plan to return in time for next year's World Para Alpine Skiing World Cup Finals in Are, Sweden. Kehoe added: "We've got things in the pipeline so it's not like we're not going to hang out and do things together but for 9 to 5 I have to do something else for a bit. "It will allow us both to come back into the sport hopefully recharged and refreshed. "We're exceptionally proud of what we have achieved - it's not been an easy season for lots of reasons but we've worked really hard. "Our goal this season was to consolidate on our results from the Paralympics and go out and prove to ourselves as much as anything that we can still compete and be the best in the world at what we do."